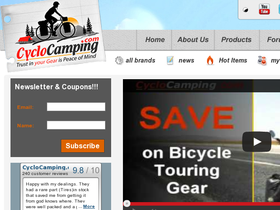 CycloCamping, online at CycloCamping.com, is your online resource for biking and camping equipment at affordable prices. 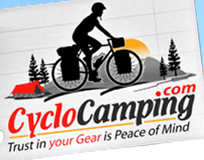 CycloCamping sells bicycle-touring equipment, head lamps, bike bags, sleeping bags, water filters, and bicycle speaker systems. At CycloCamping, you can also find bike trailers for dogs, hammocks, and other bike accessories. In addition, you can read technical articles, reviews of camping equipment, a blog, and tips and tricks as well as daily industry news at CycloCamping. RetailSteal.com has the best CycloCamping coupon codes, CycloCamping discounts, CycloCamping coupons, and CycloCamping promo codes. Shipping and handling rates at CycloCamping depend on the price of your purchase and your shipping destination. See website for full details. Exclusions may apply. Shop online at CycloCamping.com and enjoy savings up to 40% off top brands including Marmot, Garmin, GoLite, and more. Click link to start shopping. Free Shipping on Orders over $120 at CycloCamping.com. Click link to save. Check out the great selection of GPS systems at CycloCamping and save up to 30% off top brands including Garmin. Pay only $3.90 for Coghlan's Camping Guide online at CycloCamping. Click link to shop. Buy the Park Tool Big Blue Book of Bike Repair and pay only $19.90 online at CycloCamping. Click link for savings. At CycloCamping, buy a Schwalbe Marathon Supreme HS382 Folding Tire for only $52.90. Click link to purchase now. Buy a Kryptonite Krypton New York STD U-Lock for $69.90 online at CycloCamping. Click to buy. Enjoy a 40% savings on women's speedo LZR racer elite technical swimsuits when shopping at trivillage.com. Shop at trivillage.com and save 22% on regular priced items when using this promo code at checkout. Shop at trivillage.com and save 20% off everything when using this promo code at checkout. Enjoy free shipping and save 20% off all regular priced items when using this promo code at TriVillage.